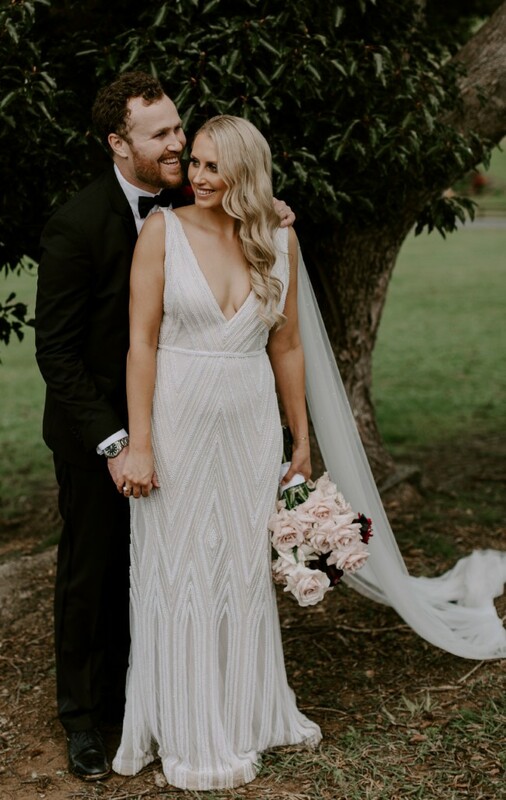 Selling my beautiful Jane Hill Dolce Gown that I wore on my wedding day in July 2018. Fully beaded, two-toned gown with v-neckline, sheer back, and belt detail. Size 10-12 with added length and minor alterations (waist and breast cups). I am 173cm tall and wore 8cm heels on the day. Dry cleaned immediately after by Leons Fine Dry Cleaning. Dress is located in Brisbane, try-on's welcomed. I also have two custom-made wing Veils with pearl detail (see images), which the buyer can have. Please feel free to ask any questions as it's such an important part of your day to feel and look incredible, and I hope someone can enjoy it as much as I did on my wedding day. Pulled in at the waist. Breast cups added. Extra dress length.